The University of Iowa tuba-euphonium studio consists of tuba and euphonium students who study with Professor John Manning and perform in the University of Iowa tuba-euphonium ensemble Collegium Tubum. Each week, students take private applied lesson, and participate in a seminar class. In addition to Collegium Tubum, members of the studio also perform in the University of Iowa’s Symphony Band, Concert Band, U Band, Symphony Orchestra, Chamber Orchestra, Hawkeye Marching Band, as well as student brass quintets and quartets. Collegium Tubum maintains an active concert schedule, with several performances each year. The group has performed at numerous festival and events throughout Eastern Iowa and appeared at numerous regional and International Tuba Euphonium Conferences. In addition to presenting studio recitals each semester, Collegium Tubum annually presents several concerts for the community, including Spooky Tubas, during the OkTUBAfest and Holiday Tubas each December. Each year, guest artists are invited to teach and perform for members of the studio. Past guests have included Oystein Baadsvik, Steven Mead, Stacy Baker, Deanna Swoboda, David Werden, Neal Corwell, Kenyon Wilson, Carol Jantsch, Tim Buzbee, Benjamin Pierce, Thomas LeLeu and Demondrae Thurman. 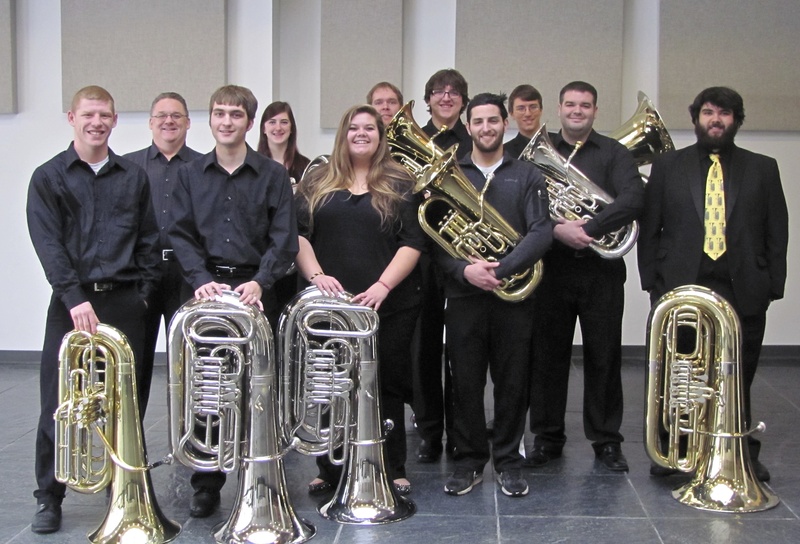 To learn more about the University of Iowa Tuba Euphonium Studio, visit our website. If you are interested in auditioning for the studio, apply for the University of Iowa here and the School of Music here. I am always very proud of all of my students. Progress, in all its forms is equally rewarding, whether large or small, but here I would like to list some of my students’ most notable accomplishments. • Six members of the studio won awards at the 2011 Great Plains Regional Tuba Euphonium Conference (GPRTEC) at Pittsburg State University, in Pittsburg, KS. In the over-21 solo tuba category, Kate Wohlman earned an Honorable Mention and and Aaron Gaither won First Place . Karina Ferrera won Second Place in the over-21 solo euphonium category and Ben Reid won Third Place in the under-21 euphonium solo competition. Finally, the University of Iowa Tuba-Euphonium Quartet won First Place in the quartet competition. • Dr. Kate Wohlman won the prestigious Iowa Performance Fellowship from the University of Iowa, graduated in 2013 and is now Corps Music Director at the Fredericksburg, VA Salvation Army Corps. • Blaine Cunningham won first place at the Tubonium7 competition, third place at the 2010 International Women’s Brass Conference, and the principal tuba position of Orchestra Iowa. • Dr. Michael Hart, class of 2010, is now director of bands at California Lutheran University. • Dr. Chris Dickey attended Northwestern University for his Doctoral degree, and has recently appointed as the Professor of Tuba and Euphonium at the Washington State University. • Blaine Cunningham won the University of Iowa Concerto Aria Competition, as well as first place at the Great Plains Regional Tuba Euphonium Conference 2009 in the over 21 solo tuba competition. • Karina Ferrera won first place at the Great Plains Regional Tuba Euphonium Conference 2009 in the under 21 solo euphonium competition. • The Iowa “Corntet” won third place at the Great Plains Regional Tuba Euphonium Conference 2009 in the tuba quartet competition. • Chris Dickey earned an Honorable Mention at the Great Plains Regional Tuba Euphonium Conference 2009 in the over 21 solo tuba competition. • Dr. Jeremy Crawford, class of 2008, was admitted to Northwestern University to pursue his graduate degree, went on to become the the graduate teaching assistant to Demondrae Thurmon at the University of Alabama and is currently Instructor of Euphonium and Tuba there. • Dr. Josh Calkin is the Professor of Low Brass at Wayne State College in Nebraska.